Vulcan is one of the brands in gym equipment market that doesn’t disappoint its customers regarding barbells, dumbbells and bumper plates. The company is run by a knowledgeable person who knows the value of hiscustomers, so he makes sure that the bars are in good quality, have a budget friendly price and the equipment beingdelivered is reasonable and durable. Keeping all such things in mind, the Vulcan stands with its pride about the product. 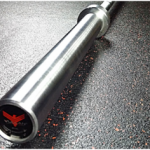 The 28.55mm Vulcan Standard Bar is constructed with great qualities and high standards and is no doubt one of the best affordable bars present in the gym equipment market. The bar is perfect for heavy duty workouts and normal commercial gym use. There is a normal gym abuse by many athletes which isof dropping of bar. So Vulcan, keeping that thing in under consideration, manufactured 28.55mm standard with such durability that can easily withstand regular gym thrashing, without breaking, bending and departing or seizing of the sleeves. 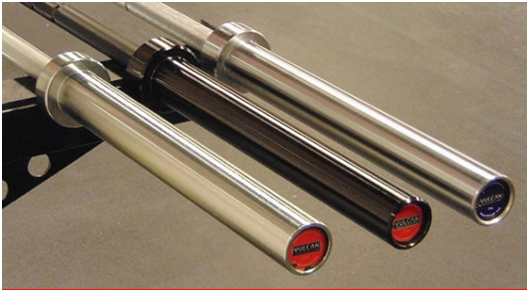 This is the reasons which makes the Vulcan Standard Bar thebest choice for commercial and home gym due to its durability, affordable price and beyond average performance. Thus providing reliability and performance both, it ensures the users that it can survive such aggressive environment. Though, to increase your satisfaction a bit more, Vulcan Standard Bar comes with a lifetime warranty against bending or breaking. The 28.5 mm Vulcan Standard is a USA-made, multi-purpose bushing bar. 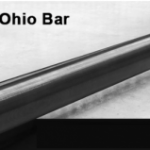 The rod of the standard bar is rated at 194,000 PSI, the sleeves rotate on oil covered bronze bushings, and the threading is moderate; which along hasno center knurl, thus making the bar perfect for high repetitive workout. The whole bar is coated with bright zinc finishing. The 28.5mm Vulcan Standard bar is very reliable which comes with an affordable price, with an added bonus of not having a single drop or chipping of black zinc anywhere on the bar. This bar is actually constructed to handle the day in and out abuse of commercial gyms and CrossFit boxes, and it also comes with a warranty of that. 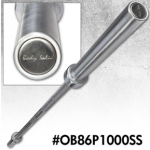 This standard barbell has the ability to withstand that type of neglecting environment, so you can expect how well they can work out if you keep them in your home gym. The 28.5mm Vulcan StandardBar uses self-lubricating bronze bushings. The reason to choose bronze bushings is due to the fact they are actually maintenance free and an ideal choice for barbells. Brass and steel are those type of material which may lose their ability to spin freely after a certain period of time. To be very honest, the natural spin can be recovered after opening up the sleeves for oiling and cleanness, but doing that regularly or even within a week takes time and energy. Hence bushings are considered one of the cheapest components in a barbell, so sharp edges arerarely expected by the manufacturer. Though, looking for brass bushings and steel manufacturing bars, in Vulcan’s gym equipment is a very wrong place to search in. The whip and sleeve rotation is just up to its mark like other bushing bars in a very affordable price range. With a very smooth turnover, you won’t expect an unethical noise, clanging of plates and any type of undesirable friction while lifting. Despite of its cheap price tag, the bar design looks very professional and bossy. The bright zinc finish on the sleeves and rod, makes it look very extravagant and appealing than most of the barbells available in the market. With a very neat and smooth finish, the bright zinc will have no issues of scratches, chipping or oxidation in future. The 28.55mm Vulcan Standard is a dual marking bar. Though, in start Vulcan wanted to offer both, IWF marked standards and dual-marked standards, but that subsequently increased the price tag of Vulcan Standard, hence they just settled down on only dual marked bar. 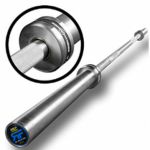 Though it is expected to see both, IPF and IWF markings on bushing bars in the coming future. The knurling pattern is perfect and comfortable for most of the people. It is between too hostile and too soft, which makes the handle comfortable and secure to grip without having the fear of dropping or digging of hands while doing longerrep sets. Hence, the knurling is very standard and is simply the one which many good companies like Rogue, XMark and many more use on their barbell. Consists of an average hostile knurling with no center knurl supported. The bar shaft and sleeves consist of bright zinc finish. Bronze bushing are oil-impregnated which need no maintenance and successive oiling. Sleeves are properly grooved to provide friction with V-Lock plates. Comes with a lifetime warranty with certain terms and conditions to follow. 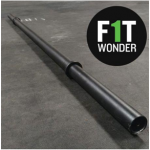 In my opinion, if you are looking for an affordable home gym or CrossFit bar, then with no further doubt in mind, 28.55mm Vulcan Standard Bar is the best for you. This barbell consists of high quality construction, which is done in a very low cost. Thus, providing you with extravagant features and benefits, which you can’t find in any other in such affordable cost. 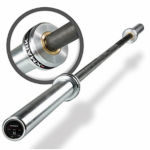 Having an above average barbell with superior spin rotation, the barbell is better than production average in both aspects, whip and PSI rating. 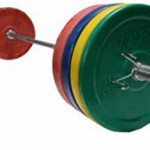 With a fine construction, it ensures that barbell has the capability to perform well over long time. Thus, seeing all such features it gives a certain doubt in mind that this bar is a bit underpriced. Though, many people reported that this Vulcan Standard Bar should come in chrome plating too. But in my opinion, I don’t think that will be a good option because chrome doesn’t really ensure you a lifetime warranty in such an affordable price. Though, why would a person will go for chrome if bright zinc is doing so well on the barbell and has no issues. Overall, after using Vulcan Standard Bar, I didn’t face such major issues and with a lifetime warranty in my bag, my satisfaction is preserved as well. Thus a big thumb to Vulcan and whoever their manufacturers are and I would strongly recommend to everyone who are looking to buy an affordable barbell having high quality and durability. Comes with a very affordable price in which shipping is also included. Self-lubricated bronze bushings reduce the need of successive oiling and maintenance from time to time. The barbell has the ability to withstand dropping without giving a dent, bend or break on the barbell. A much moderated knurling is done on the shaft which doesn’t require a use of gloves. Bright zinc finish gives a very aesthetic look and design which is very eye warming. The barbell comes in bad package. Shipping is free but takes a lot of time.